How much does it cost to travel to Buzios? How much money will you need in Buzios? R$160 ($41) is the average daily price for traveling in Buzios. The average price of food for one day is R$10 ($2.54). The average price of a hotel for a couple is R$300 ($76). Additional pricing is in the table below. These average travel prices have been collected from other travelers to help you plan your own travel budget. Initially a fishing village, Armação dos Buzios is a small beach resort town about three hours from Rio de Janeiro by bus. Buzios is a common weekend getaway destination for Cariocas. With 23 beaches, visitors from all over come to swim, snorkel, surf and enjoy sun and sand. Rua das Pedras is the main pedestrian street in Armação which runs along the edge of the Atlantic Ocean, great for strolling, dining, shopping, and entertainment. Parking can be difficult to find, but bargaining is encouraged. Day or night, Rua das Pedras is bustling with diners, families, and people-watchers of all ages, especially during high season. Both small boutiques and designer labels have their shops here for those keen on shopping. Ladies should leave their high heels behind if they want to avoid getting stuck in the cobblestone street. Rua das Pedras is the place to be at night with its variety of restaurants, bars and nightlife which starts late and closes even later. A walk along Orla Bardot, just east of Rua das Pedras, provides beautiful panoramic views of the water, less for swimming than for views and boat rides. Many docked fishing boats as well as bronze status of fishermen casting their nets to sea can be seen along this walking path. Don't miss the bronze statue of Brigitte Bardot seated on a bench, who made Buzios famous when she visited in the 60s. At the end of the Orla Bardot is Praça dos Ossos, which features Christina Motta's bronze sculptures of children at play, entitled "Child Scene." Motta's work displays a girl walking the ledge of a bench and another girl lying down, reading book, and their black and white puppy approaching. Of the 23 beaches, Praia Azeda and Praia Azedina are two small beaches on the northwest side with clear and calm waters, perfect for fishing, boating or swimming and accessible via boat-taxi or a walk from Armação. On the other side is Praia de Ferradura, also known as Horseshoe Beach, named for its shape. It is likewise protected from the strong Atlantic waves and is ideal for swimming, snorkeling, and watersports, like jet-skiing. Families and vacationers of all ages can enjoy the sand, waters, and shade of the straw huts. On the southside is Praia Ferradurinha, a smaller and more secluded beach accessible only via taxi or car and then a short walk to the beach, as roads become too narrow for vehicles. Ferradurinha has a short stretch of sand with calm waters because of the cove which protects it from waves. The beach is a starting point for paddleboarders and kayakers, and also houses a restaurant and bar close to the shore. The jutting and flat rocks offer a picturesque photo opp with clear blue waters and views looking inland and out into the ocean. Just northwest of Praia Ferradura is of Praia de Geriba, a long stretch of beach with soft sands and various surfing conditions. This beach is popular with families and surfers and in the center, features Fishbone, a popular beach club and restaurant, famous for its moqueca. Toward the north side of the peninsula is Porto da Barra, originally a fish market that is now in an area populated with many restaurants and shops and boasts a relaxed and romantic ambiance to watch the sunset. Just west of Porta da Barra is Praia de Manguinhos, a much quieter beach popular for sailing, jet skiing and other water sports. Other attractions include the mangroves that line the beach, the pier for beautiful photos and the numerous fishing boats. Balancing the rest and relaxation during the day, Buzios is known for its electric nightlife scene. Rua Das Pedras comes alive after dark for those who want to dance, drink, and crawl from pubs to bars to discos. Privilege offers an upscale swanky and glamorous party, complete with live music, acrobat dancers, and a VIP upstairs area open to the well-dressed or willing to pay 5 Real. Nearby Pacha is a beachfront franchise nightclub which originated in Ibiza and caters to electronica music lovers. The party doesn't get started until after midnight and doesn't end until early morning. Patio Havana is a bar and restaurant, offering well-priced food and drink and features live music. For those who want a lower-profile night out on the town, Anexo Bar and Lounge is a perfect place to sit back, sip and watch the action outside. After a late night, Chez Michou is the place to be for both dessert or an after-party snack, offering both sweet and savory crepes open until 6 a.m. in high season. Most restaurants are located in the "downtown" area of Armação, along the cobblestone street of Rua das Pedras. While restaurants are generally upscale and expensive, dining itself is an event that deserves leisure time and Buzios offers a plethora of international fare. Located in Hotel Abracadabra, Mistico Sunset Lounge and Restaurant is known for its classy ambiance and decor and beautiful hilltop view overlooking the bay, as well as excellent crabcakes and steak. Those with adventurous palates can try Bananaland, which offers food "por quilo," a buffet charged by weight. Prices will vary depending on the weight of food ordered, but self-service and variety are the highlight of this restaurant. Budget-conscious travelers can dine at Pimenta Siria Buzios, which serves reasonably-priced Middle-Eastern fare, boasting a delicious tasting plate for two as well as hookah. Sukao Bar also offers great value in casual sandwiches,burgers and sidewalk dining. Despite its upscale reputation, Buzios offers accommodations at all price ranges. Bask in 4-star luxury at the Casas Brancas Boutique Hotel & Spa resort, which overlooks the Orla Bardot waterfront promenade. On the other side of the peninsula is 4-star Hotel Le Relais La Borie on Geriba Beach with full ocean view suites and exceptional service. Moderately priced accommodations include Pousada Aguas Claras Buzios, featuring a pool and sauna as well as complimentary cakes that past guests seem to love. Away from the center is the quieter, family-owned Hotel Pousada Experience Joao Fernandes, which offers a more personal experience with bright and modern rooms and an incredible breakfast buffet, just a five minute walk to Joao Fernandes beach. For budget travelers, just one block from Geriba Beach, Local Friend Buzios is a clean and comfortable budget hostel, perfect for single travellers looking to meet friends. Bus tickets to Buzios can be purchased at the Rio Central Bus station from 1001 ("Mil e Um") Bus. Buses stop right in the center of the small town, where the 1001 Bus station is located. Check online at http://www.autoviacao1001.com.br/en/ for hours and discounts before you buy. Because Buzios is a small town, you can walk the entire area of Armação. To get to the beaches, take a taxi or boat-taxi. Regular taxis can be contacted via the local free app, Taxi Búzios Cliente APK. Water taxi prices are posted at the docks. Besides walking, minibuses are the most economical option. They run along José Bento Ribeiro Dantas Road, which is the main road that runs the length of the town. Depending on where you are going, the minibuses may not take you directly to your destination, but will drop you off at the nearest stop, greatly reducing walking distances. 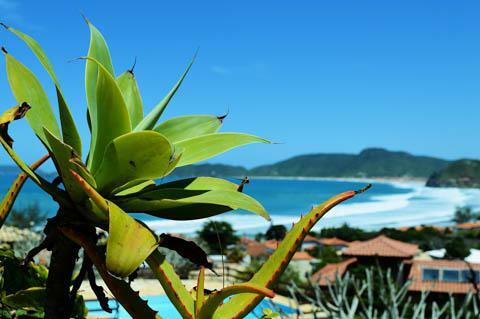 The peak season to visit Armacao de Buzios is between the months of November and March. June and July are also peak months during the area's school holidays. Low season is between March and May, as well as August through October. The shoulder season, when the weather is still dry, but the area is less crowded, are the months of May and April. December is the most busy months when there are plenty of parties, but also steep prices. March is the rainiest month so be warned.